On March 24th, Mr. Gilmar Nunes, Weatherford ALS Manufacturing Director and Mr. Mauro Silvar, Weatherford ALS Manufacturing Planning Manager visited Highland’s No. 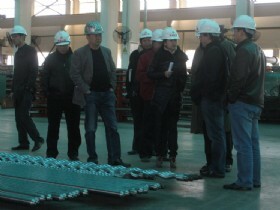 3 Industrial Park, accompanied by Mr. Yang, Xian Ping, CEO of Shengli Highland. Mr. Gilmar Nunes is mainly responsible for the overall manufacture management on Weatherford’s 40 plants globally.